Hope you are enjoying this time with family and friends. 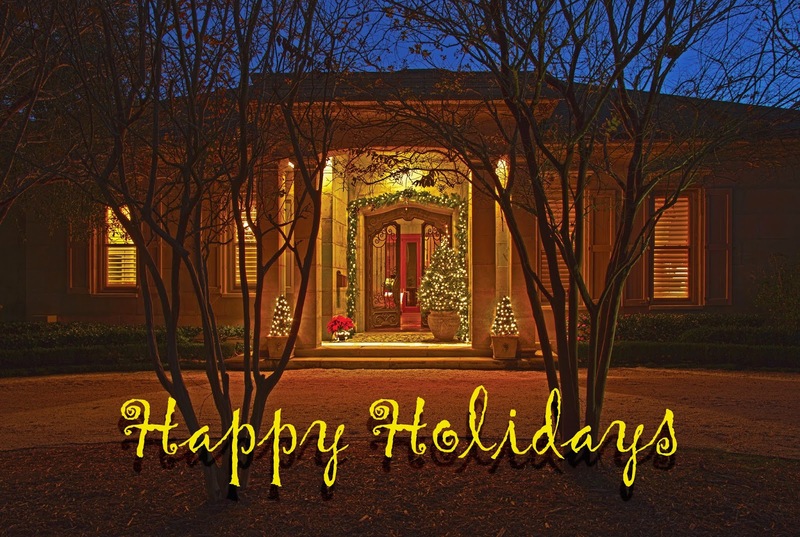 Our holiday card this year features a DAC-ART home in Gulf Breeze, Fla. We appreciate our clients for generously allowing us to photograph their home so that we may share it with you this holiday season. 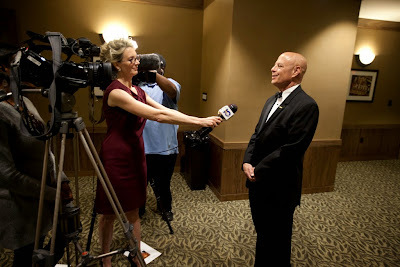 at an annual gala held at the University of South Alabama in Mobile. 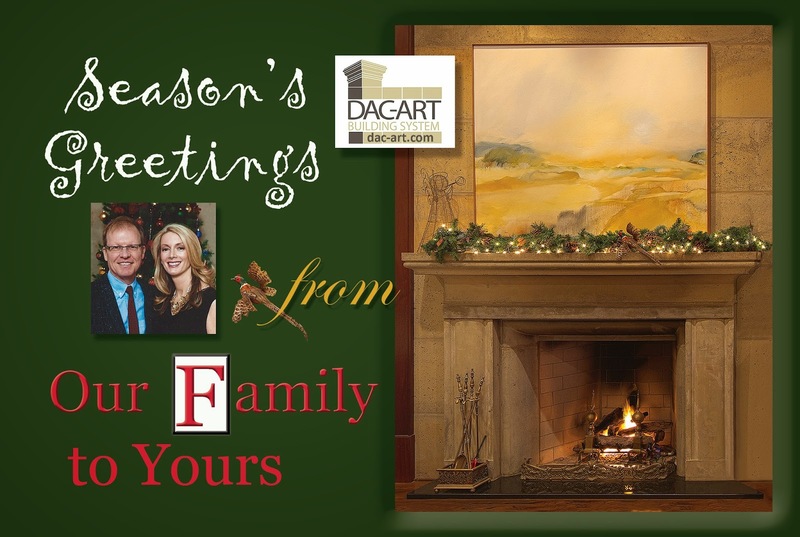 This year, I have had the extreme pleasure of meeting many past and potential DAC-ART clients who live in virtually every area of the country. My experience has inspired me to write about it in a new blog. In it you will see photos of some magnificent, yet extremely diverse DAC-ART homes, read some personal client stories, get tips on how to build the strongest and most maintenance-free home possible, and learn more about how DAC-ART creator Ted Dial can work with you to design a unique living space that suits your lifestyle and tastes. I will also highlight a little local flavor from client hometowns, give homeowner design tips, share some of their favorite recipes and secrets to creating their ideal homes. I recently visited with DAC-ART homeowners on the beautiful Florida coast. This coastal cottage has 3,500 square feet of heated and cooled space, with a roomy backyard veranda and outdoor kitchen bringing the total size of the home to 4,500 square feet. 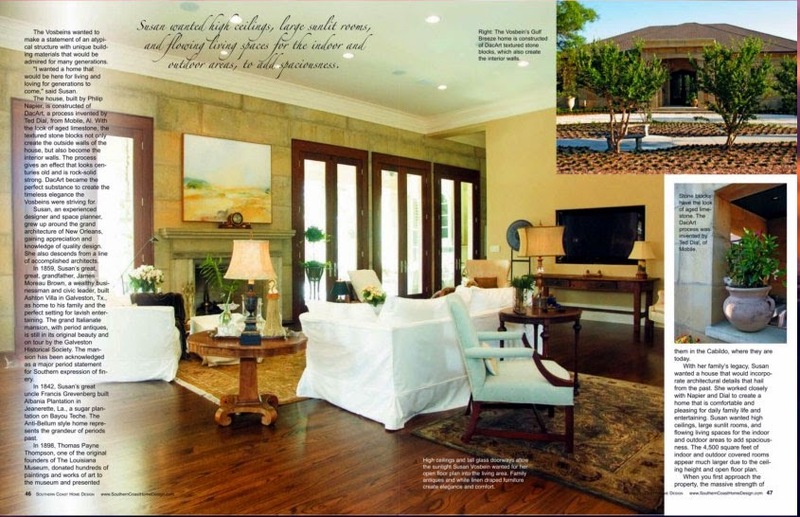 The couple has become such proponents of DAC-ART, which provides them sound protection against Gulf Coast hurricanes, that they wanted to tell others about it in Southern Coast Home Design magazine. The article below shows how DAC-ART components provide finished surfaces on both the exterior and interior walls without the need to apply stucco, paint or other finishes to it. If the homeowner desires a different look, interior walls may be finished with stucco or framed-in with sheetrock. Most homeowners love the natural "limestone" look of DAC-ART. 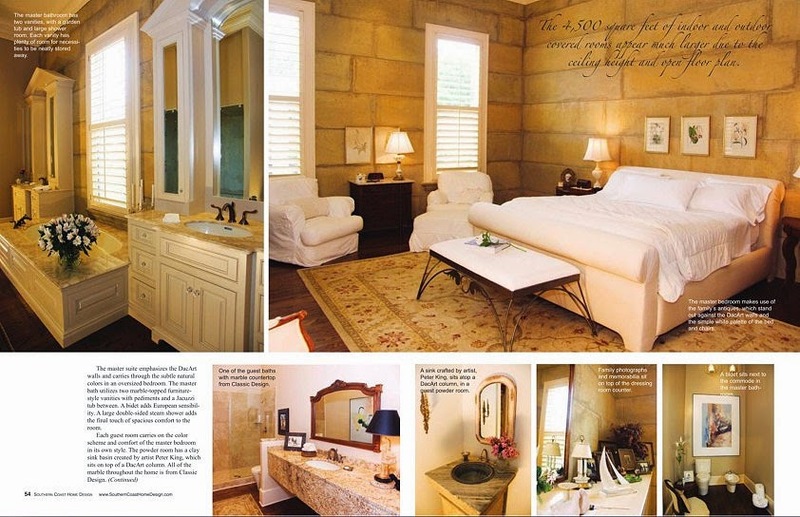 The article photos show how warm and inviting DAC-ART concrete "stone" walls can be in a home's interior. 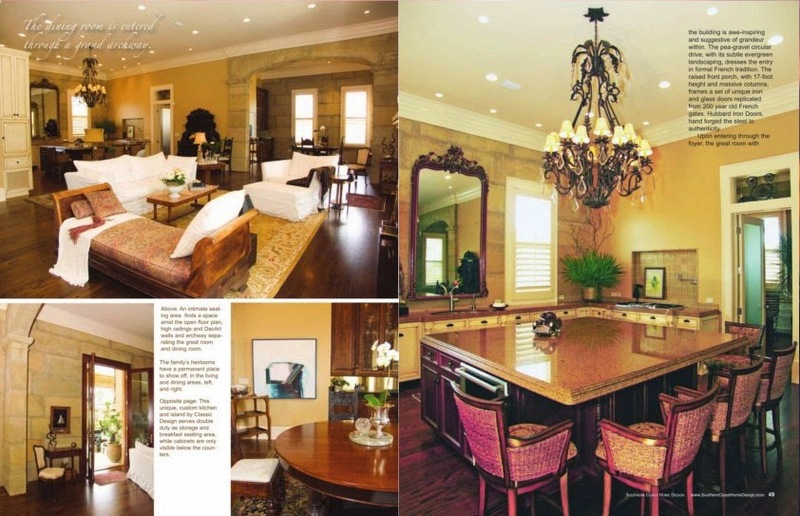 Scroll to the end of the "Home Design" article to get this DAC-ART homeowner's recipe for super moist crab cakes. (You'll never guess the secret ingredient.) Register to win a crab cake kit, which includes a $25 gift card from Florida's famous Joe Patti's Seafood, their recipe book, beignet mix, and a cap . You can use the gift card to order fresh seafood online. To enter, visit www.dac-art.com and e-mail DAC-ART designer Ted Dial using the link at the bottom of his webpage. Write "CRAB" in the subject line. Only one entry per person. 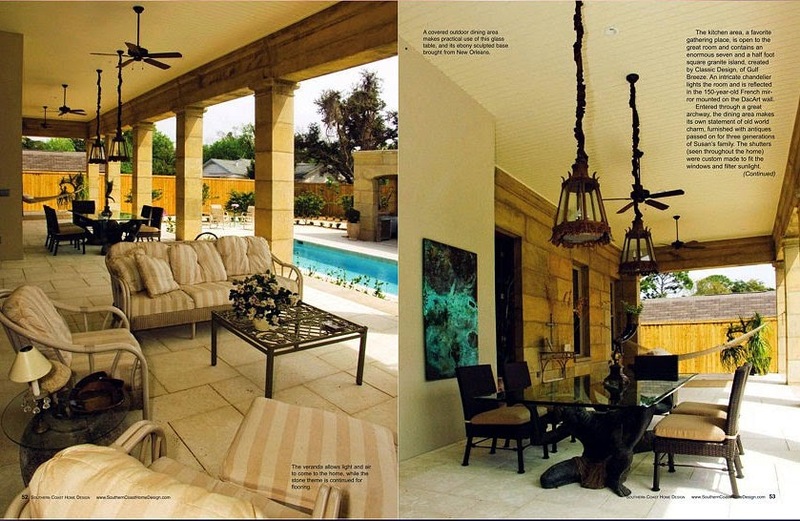 This DAC-ART home on the Florida coast was featured on the cover of Southern Coast Home Design. 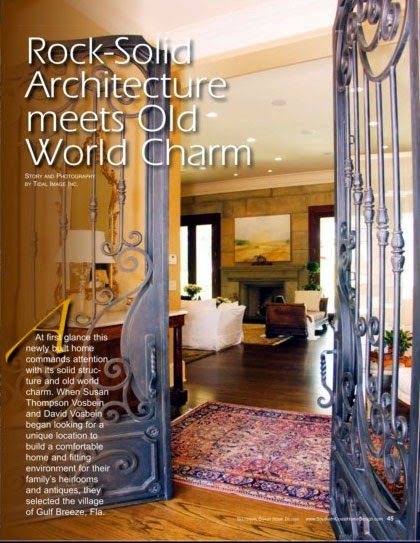 Photos of the home's interior illustrate how DAC-ART lends a touch of old-world elegance found in historic, solid stone masonry buildings. One of the greatest things about meeting DAC-ART clients is they all seem to have exquisite taste in food. Fortunately for me, they often invite Ted and me to try some of their favorite recipes. I don't know about you, but as someone who has grown up on the Gulf Coast, I'm always in search of the perfect crab cake. Most of the time I'm disappointed because they are mostly breading and grease. Our Gulf Breeze, Fla., clients surprised us by serving possibly the best crab cakes we've ever eaten. The secret ingredient? Eggplant! Yes, eggplant replaces the enormous amount of breading that is typically used to hold crab cakes together. 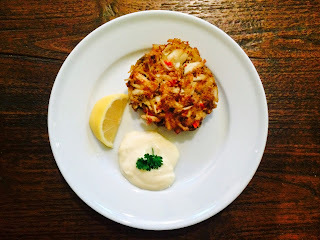 The end result is a super moist crab cake that may only be improved with a touch of lemon or dash of Woeber's Horseradish Sauce (another tip we got from our Florida clients). Please enjoy the recipe below, but you may want to take a tip from me...don't tell your family (or dinner guests) that you're serving them crab cakes with eggplant. Believe me, they'll never know. I experimented with my own family. And, I want to say thanks again to our DAC-ART clients in Gulf Breeze for sharing their treasured recipe. 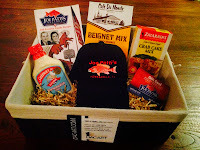 See instructions above and register to win your own crab cake kit that I pulled together after a visit to Joe Patti's Seafood near Pensacola, Fla. It includes everything you'll need except for the eggplant and crab. 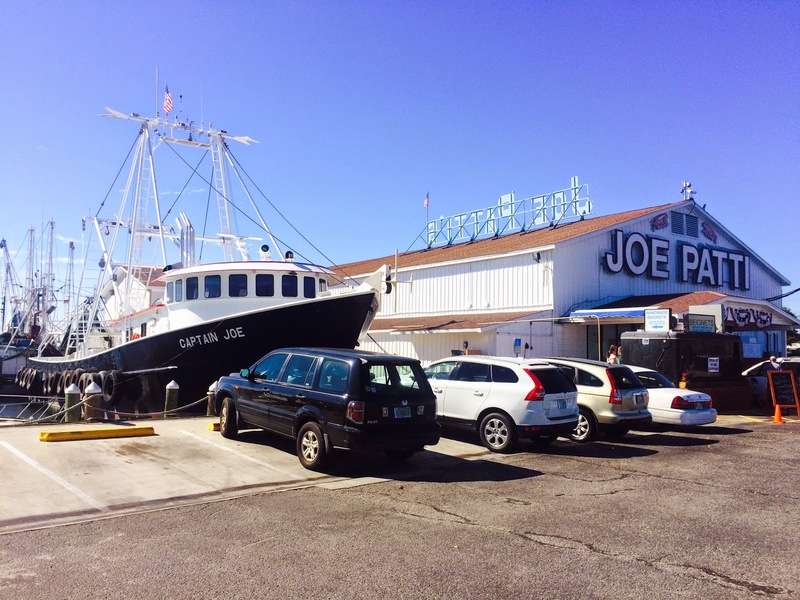 There's a $25 gift card from Joe Patti's, which may be used to order their fresh seafood online. The kit even includes a bottle of Woeber's Horseradish Sauce, the perfect companion to this crab cake dish. There's also a cap and Joe Patti's recipe book. 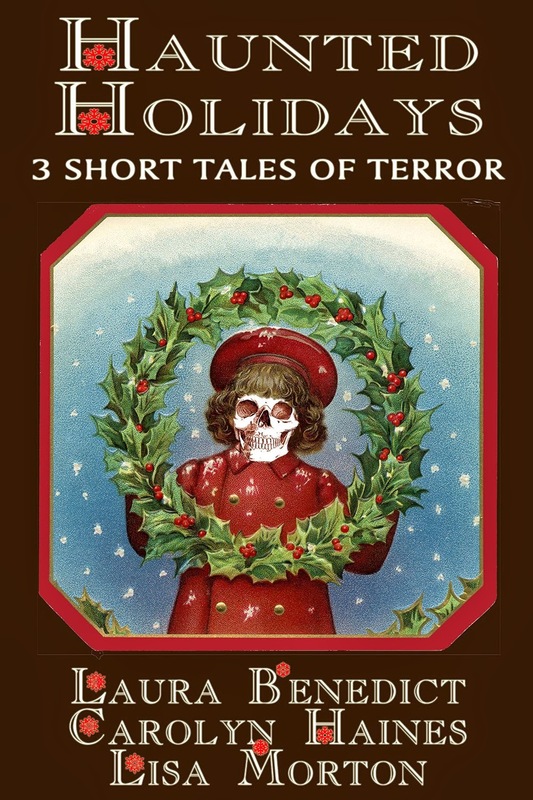 A winner will be selected and notified on Friday, Dec. 5, 2014, via e-mail. All ingredients for the crab cakes may be purchased from Joe Patti's, or you may also find them at most major grocery stores, including Publix. 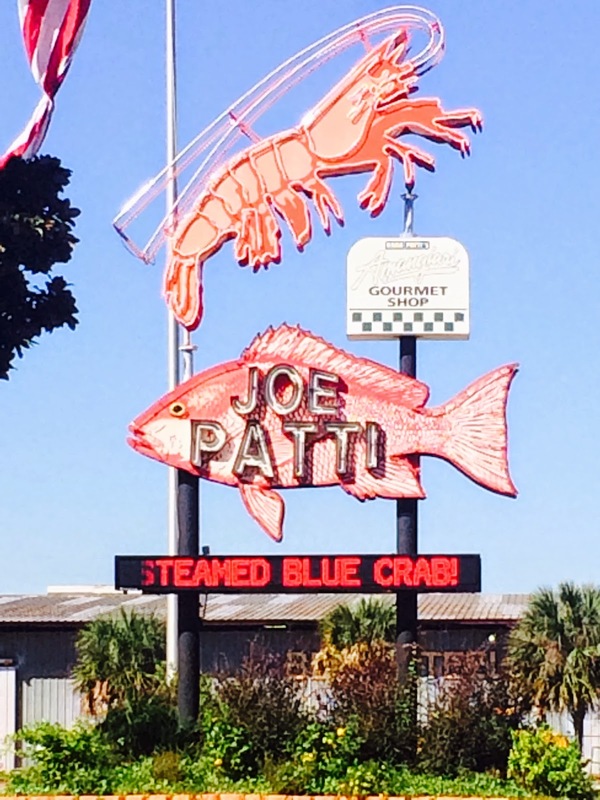 Joe Patti's Seafood in Pensacola, Fla. Online ordering is available at http://www.joepattis.com/Joe-Pattis-Seafood-Company-History.cfm . Notice that they serve fresh, hot beignets at a stand in front of the market. 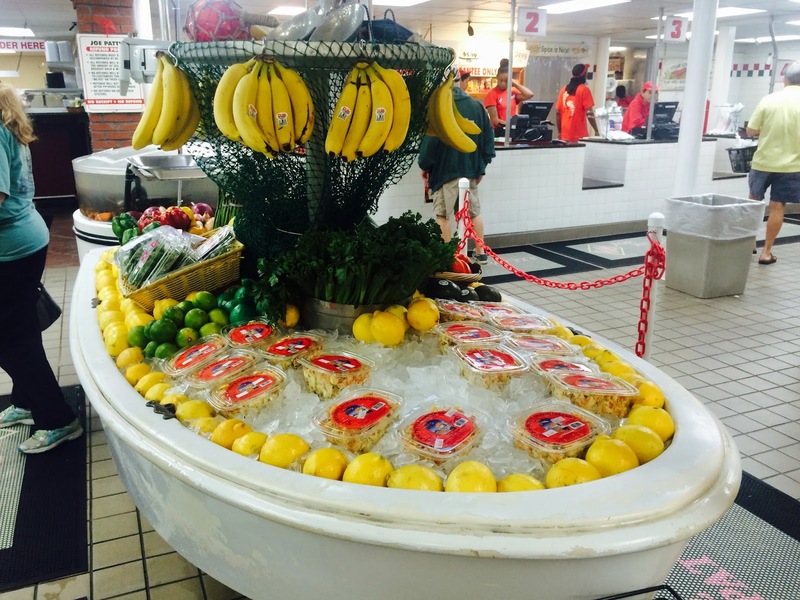 This is one of the beautiful displays at Joe Patti's. Our Gulf Breeze DAC-ART clients also served fresh October beans with the crab cakes. As a Southerner, I was surprised to learn that there was a bean I'd not yet consumed, nor heard of before then. They were served in a dish with chopped red bell pepper and fresh corn. 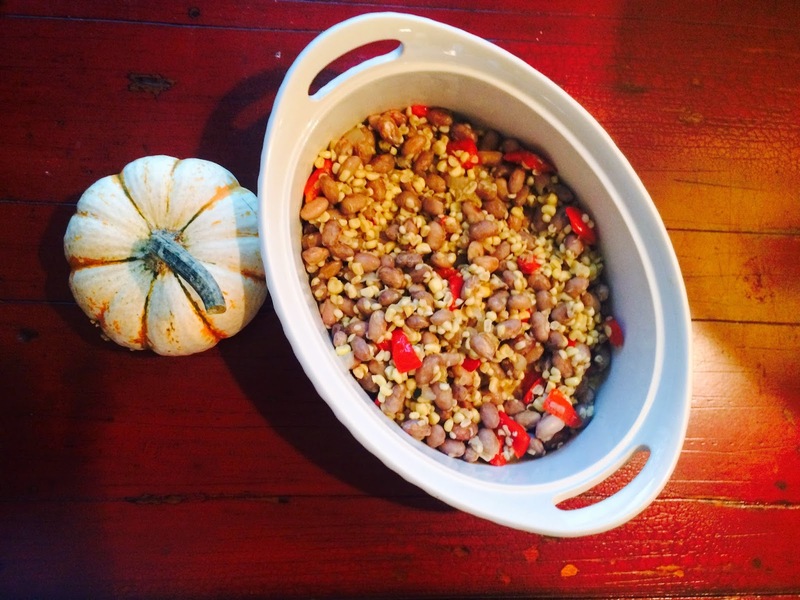 I was so excited about this newly discovered bean that I had to cook some for my own family. 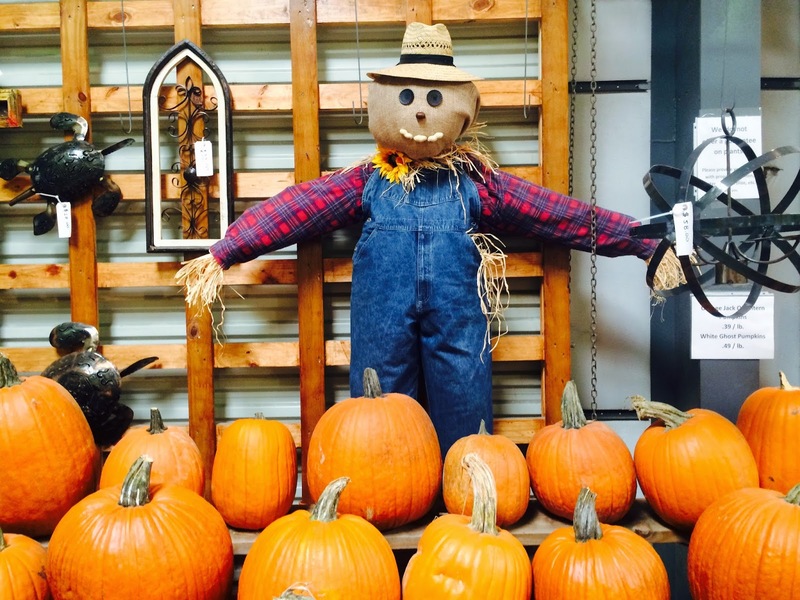 I found the October beans and cute little pumpkin (in photo) at Bailey's Market in Pensacola, Fla. Of course, we learned about Bailey's from our clients. 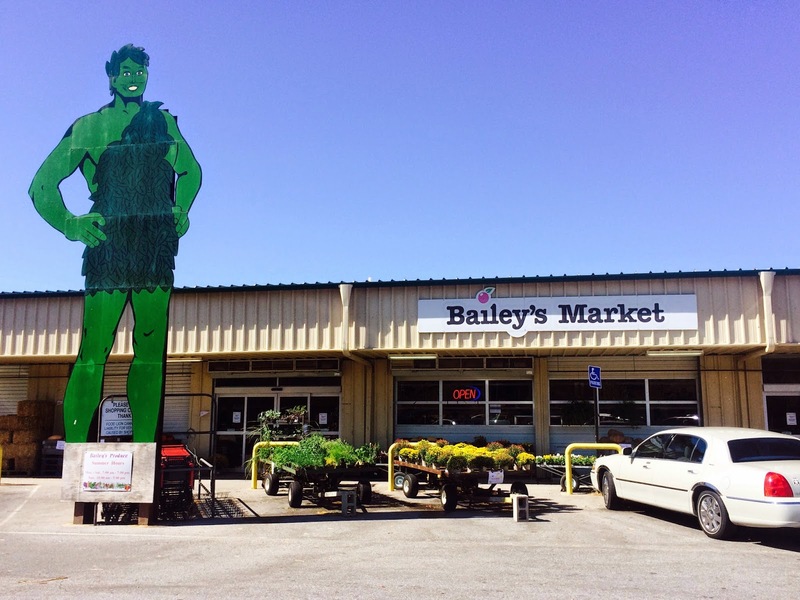 It's pretty difficult to miss Bailey's Market with this jolly green gentleman guarding the entrance. Bailey's is home of the rare October bean. 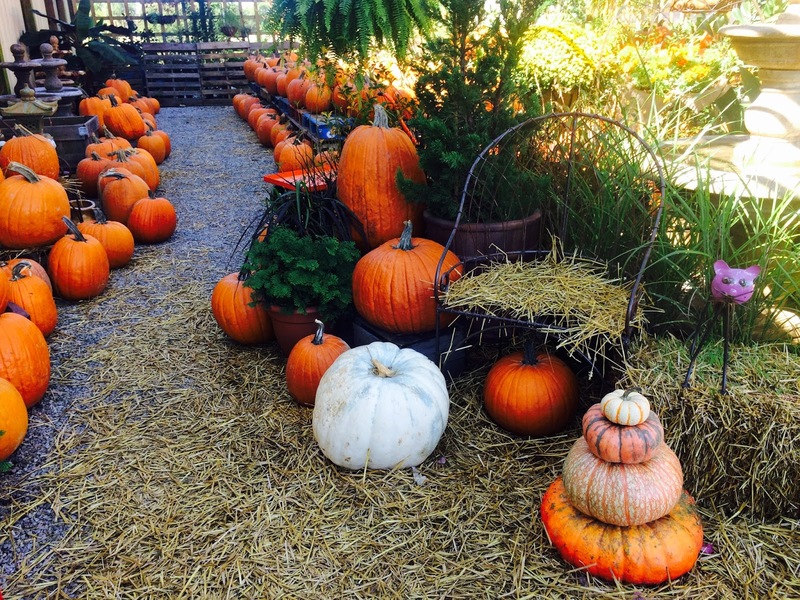 Bailey's also has the largest, most exotic selection of pumpkins I've ever seen. 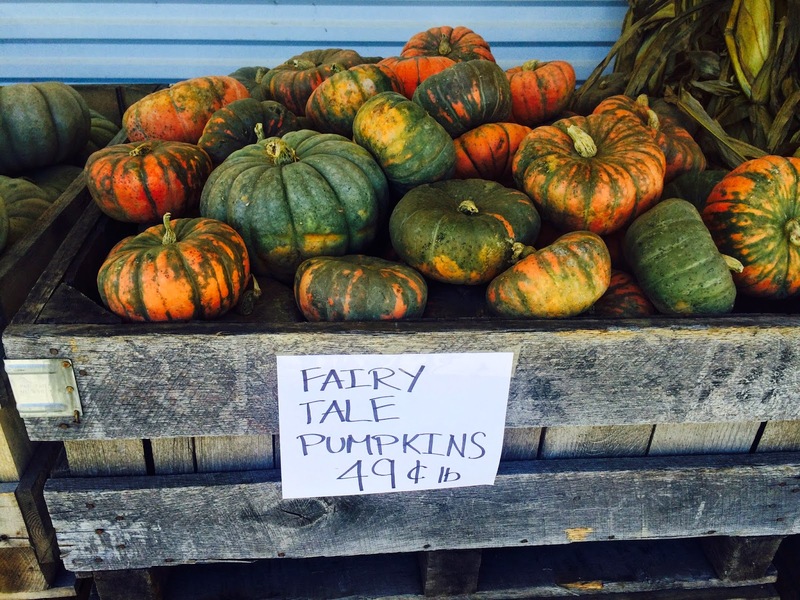 I wonder if it's possible to get this guy to stack DAC-ART blocks as neatly as he stacks his pumpkins? 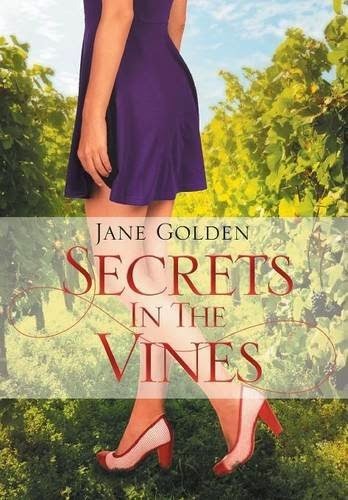 I end my blog this week with one of my favorite Southern staples. 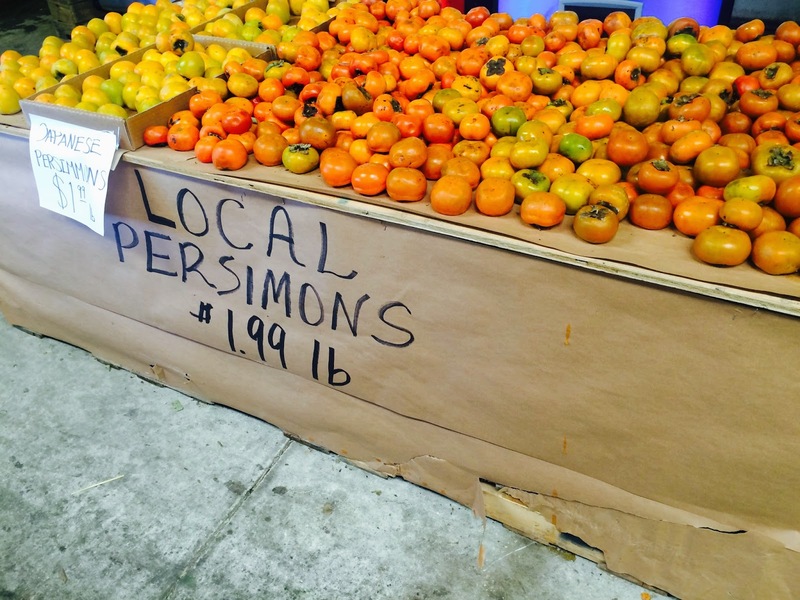 Nothing says fall in the South like a bright orange persimmon. Yum! 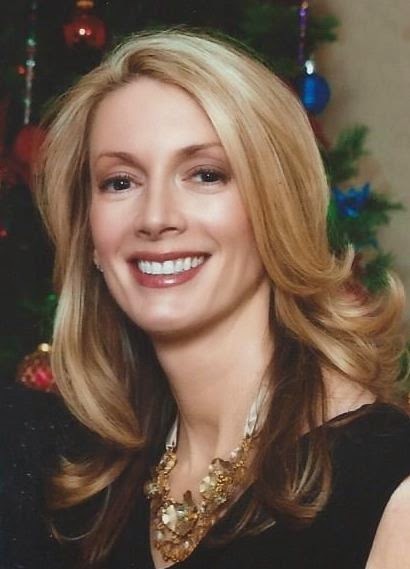 My name is Renee Paul, and I am the creator of the DAC-ART Concrete Stone Home blog. 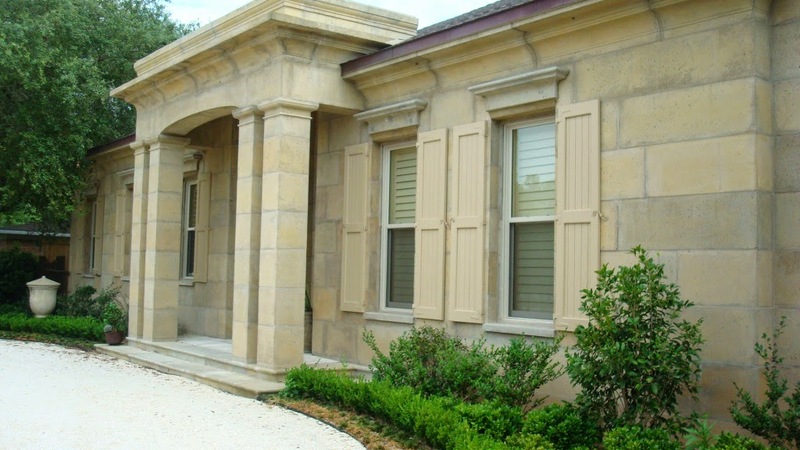 I write once a week about my passion for historic stone architecture and how you can achieve that same look and quality using the DAC-ART Building System, a method of building with concrete that has all the aesthetic beauty, strength and durability of solid stone construction. 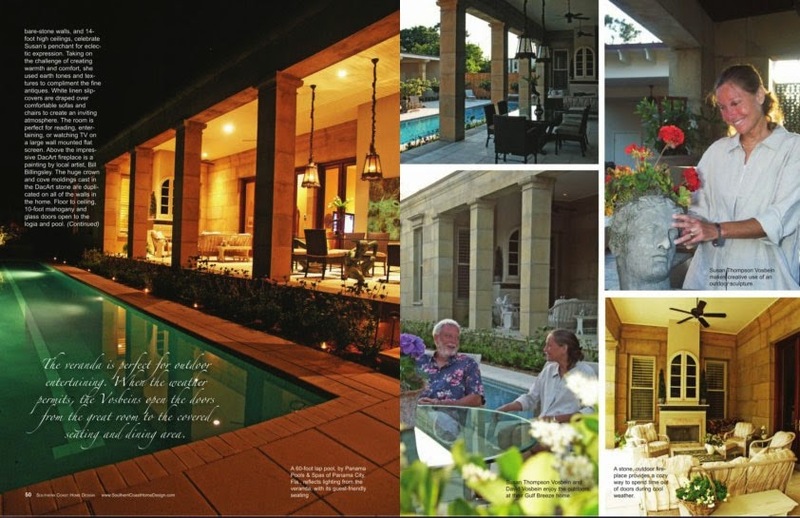 In my blog, I report on the latest projects and progress of DAC-ART’s creator, Ted Dial, who has worked for more than 15 years to restore the lost art of solid masonry architecture through his custom home designs which are built using his own revolutionary “concrete” stone building system. My blog followers have an appreciation for the old-world charm of solid stone masonry and are interested in building a unique, custom home that requires no maintenance and provides the best protection against extreme weather conditions and natural disasters such as hurricanes, tornadoes, earthquakes and fire. My followers are unhappy with modern building methods such as weak, high-maintenance wood construction and the cheap “cookie-cutter” look of concrete ICF construction, which also requires regular painting and upkeep. They want a home that is unique and will stand the test of time, just as historic stone architecture has in places such as New York, Washington-DC, France and Italy. 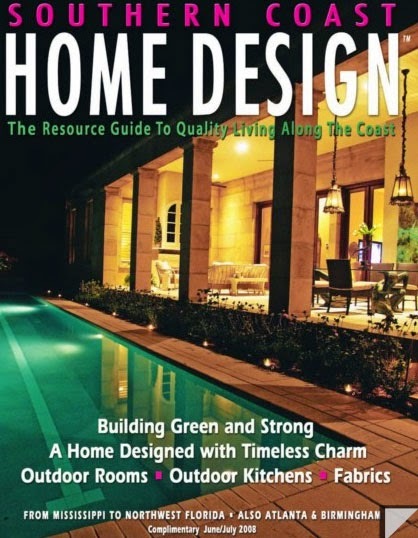 I have the goal of reaching more than 50,000 unique visitors a month in my quest to help introduce DAC-ART as the best alternative to the status quo of today’s construction industry—boring home design and the flimsy, “disposable” nature of the single, most important investment of your life. Check out Ted's website, www.dac-art.com.